Hello from Becky and Jonathan! In preparation for our upcoming trip to New Zealand, we’re starting a blog to share photos we take over the next five or six months. From September 1st to December 17th, we’ll live, work, and travel in New Zealand. We’ll be in Wellington primarily, but we plan to buy a car and trek around as much of the country as possible. December 17th, we fly back to the US, arriving nine hours before we leave. (Then the earth implodes.) We’ll spend Christmas with Becky’s family, then head back across the country on a more meandering southerly route. Right now we’re trying to work, pack, and tie up loose ends all while planning this exciting trip. (At least the visa/immigration stuff is finally done.) 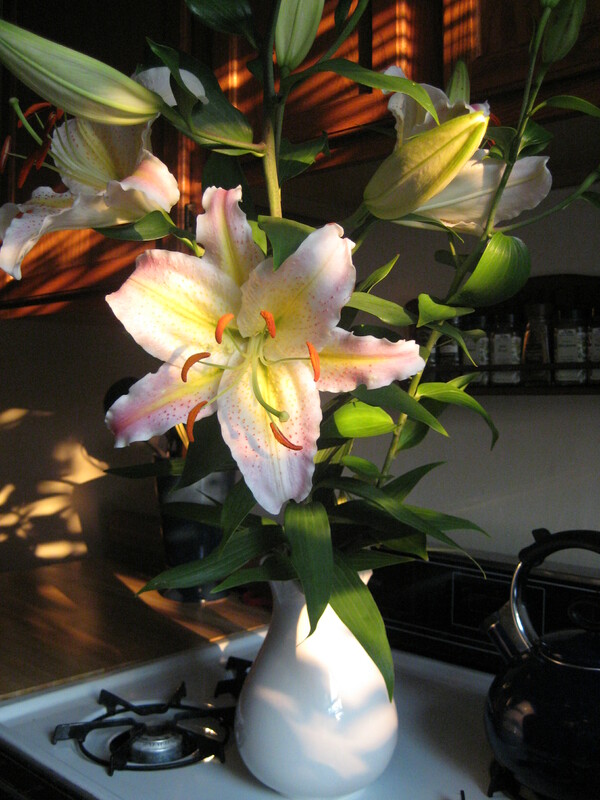 Jonathan’s dad is not only letting us use his basement as storage for the time we’re away; he’s also sent us lilies from his garden which are making the apartment smell heavenly. They’re beautiful, which is why they’re the inaugural picture in our photo blog. This entry was posted on July 18, 2008 at 12:07 am and is filed under Uncategorized. You can follow any responses to this entry through the RSS 2.0 feed. You can leave a response, or trackback from your own site. I JUST realized that your banner photo is a kiwi. Hilarious! Those lilies are absolutely gorgeous! I agree with the kiwi comment, very witty. Have a great time you guys, and I look forward to following along on here.